It's all about finding the right angle. For the record, I am not allowed to have any. Only the Mommy can. I don't think that is fair. I have made a new friend and his name is Lloyd. - He lives in Edmonton, Alberta, Canada. - He was homeless! I'm sure glad he has a home now. - He likes to give the bitey, especially to the feet. - His favorite spot is in the fridge. I think that is a bit weird, but he is unique that way. - He likes to eat all kinds of food, even pumpkin and tea! I like making new friends! This is what I saw on Saturday morning. Do you see the snow on the ground outside? In this picture you can see the snowflakes that didn't melt yet. They are neat! Did you know that kitties can get a new coat in the winter? This is what Marzi's looks like. As you can see, Marzi is so comfy in his winter coat. Humans will do all kinds of things to keep warm in the winter months. What do you do to keep warm on those white snowy days? Sometimes when Marzi sleeps he sticks his tongue out. 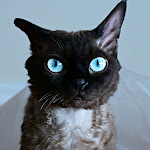 I'm Henry and I am a black smoke Devon Rex cat. I live in Edmonton, Alberta, Canada. 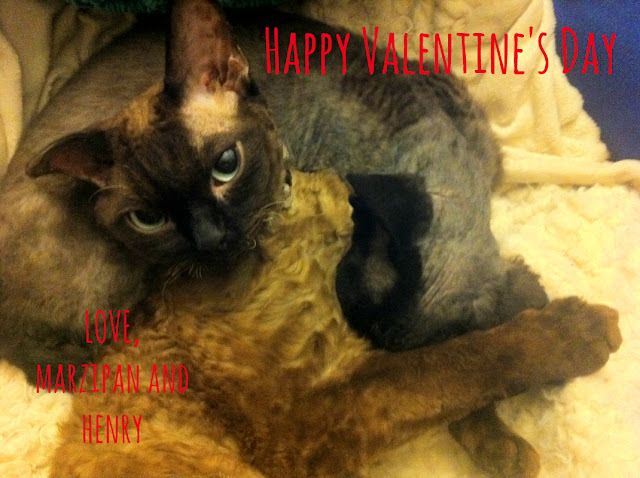 I live with my birth Dad Marzipan, he's a smoke seal mink Devon Rex and a black tabby cat named Mama.